Welcome to 20 Years On, a series here on VivaLaVidaFM where we take one of the games hottest prospects and see where they end up at the end of their career in Football Manager. In this post, we see where Dortmund and English youngster Jadon Sancho could end up in 20 years time. Jadon Sancho began his footballing career by joining Watford aged 7. He later moved to Manchester City where he was highlighted by chairman Khaldoon Al Mubarak as one of three top youth prospects at the club who should be fast-tracked to the first-team. However, Sancho was not happy with the playing time he was offered in a new contract and he left the club in August 2017. Sancho joined Borussia Dortmund for £8million and he was immediately promoted to the first-team to wear the number 7 shirt. He made his debut for Dortmund in October 2017, becoming the first Englishman to appear for the club in the Bundesliga, and looks set to be a very good prospect for the English national team. Sancho, although only aged 17, is already a first-team squad member at the beginning of this FM18 save. He became a vital part of the team in his time with the club, helping them to win three Bundesliga titles and a German cup too. Sancho developed into a world-class player with Dortmund and it was only a matter of time before Europe’s elite came calling. PSG signed Jadon Sancho in 2026 for a huge £81M fee. In his time in France he won six league titles, 2 domestic cups and, most importantly, he won the Champions League. After 8 years with PSG he left on a free transfer. Lazio were the team to sign Sancho for the final years of his career and it is clear that he declined naturally over his two seasons with Lazio, making just one appearance in the final season of his career. Sancho was a key member of England’s national side for the best part of ten years and he helped them reach TWO World Cup finals. Sadly for Sancho and England, they lost both finals – 2-0 to Portugal in 2026 and then in 2030 they lost on penalties to Holland. 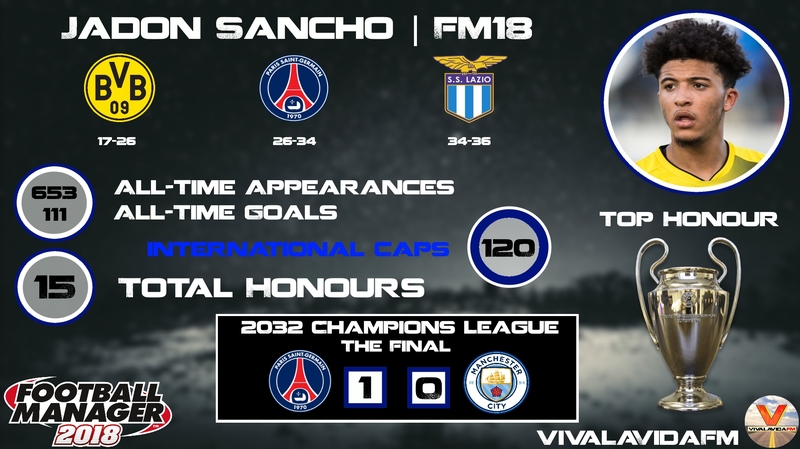 This entry was posted in FM Wonderkids | 20 Years On, FM18 Guides, Experiments & Wonderkids, Football Manager 2018 and tagged borussia dortmund, england, fm wonderkids, fm18, football manager, germany, jadon sancho. Bookmark the permalink.